This article covers a wide spectrum of common yachting terms which are often found in articles and brochures regarding yachts which is helpful for yacht buyers. AIS – A new device acting as a transponder (similar to aircraft transponders) which identity the vessel and other vessels. Typically name, vessel information, course and speed are displayed and made available to other traffic. Amidship – (or mid-ship) this is the center area of the yacht, thus a ‘mid-ship stateroom’ . Cooler in temperature for transmitting heat. Darker colors show salt crystals and water spots, thus requiring more care. Lasts longer with UV radiation. Beam – The width of the yacht. A wider beam yacht offers much more livable volume, but often at the sacrifice of speed. Bulbous Bow – an appendage added to the bow underwater designed to spread the bow wave at displacement or hull speeds which can reduce the friction on the hull…thus increasing efficiency. Found commonly on large commercial vessels. Bow – this is the forward area of the yacht. Bulkhead – All yachts have structural panels which traverse perpendicular to the keel, adding rigidity and strength. A collision bulkhead is designed to prevent water from coming in and sinking the yacht in the event of a head-on collision. Most engine rooms are designed with watertight bulkheads to prevent flooding from spreading to the rest of the yacht. Chilled Water Air Conditioning – An efficient form of controlling yacht temperature via the method of transferring heat through enclosed loops of cooled water and blowers. Most yachts above 80′ use this method. Otherwise, individual compressors and evaporators are used for each room section called direct-expansion. Chine – refers to the area where the hull is shaped below the water line to begin its transverse to the hull side. 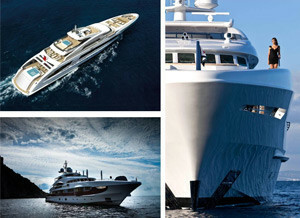 A round chine is curved and normally found on trawlers, whereas a hard chine is found on motor yachts which go faster. The chine plays an important role in ‘roll’. 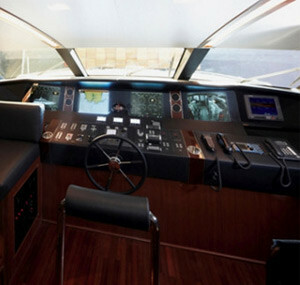 Cockpit – An open area at the stern of many yachts that has bulwarks (sides) and a transom (stern end) that is lower than the rest of the boat and easier to fish, dive and swim off of, with a gate to a swim platform. Because of its protected nature, it is safe to occupy and access the engine room while underway. Coring– Modern boat building using FRP employ ‘sandwich’ or cored laminate to build yachts. A thin skin is bonded to either side of a core material (balsa or foam), and sometimes “vacuum-bagged” to pull the resin completely through the foam coring so that the cured product is one very tough and lightweight material which has fine thermal, acoustic and strength properties.Most fiberglass yachts have solid FRP hulls (below waterline) and foam-cored sides, decks and superstructures. FRP is heavy though, so most fast sport fishers and cruisers have cored hulls as well. It is critical to have solid FRP around any hull penetrations so that water does not creep in to the coring. Country Kitchen – A galley with an open design with large counters and a large settee for gathering. Typically found on most raised pilothouse style American yachts in the 90-110′ range. Dayhead – A small bathroom typically found on the main deck of most larger yachts for guests so that they don’t have to go below and use the stateroom baths. Displacement Hull – The displacement hull displaces water equal to its total weight. As the displacement hull begins to move through the water, small waves appear at the bow and further aft along the hull. When speed is increased, these waves grow larger and the distance between them increases, until the boat is riding between the two waves at the bow and stern. At this point, the hull has reached its maximum hull speed. Trawlers and Long Range Cruisers (LRC) have deep, wide and round hull bottoms which allow for slower, comfortable sea keeping, economical operation and range. However, many yachts operate at displacement speeds – especially with the cost of fuel on the rise.There is a simple formula to work out the hull speed of a displacement hull in knots: 1.39 x the Square Root of the Boat’s Waterline Length in feet. Thus, if the waterline length is 100 ft: multiply 1.39 by the square root of 100 to find a hull speed of 13.4 knots.Displacement hulls have several advantages – they require relatively little horsepower to drive them through the water, so the fuel consumption of the yacht is much lower and because a yacht can only carry so much fuel on board, range increase drastically. Draft – A yachting term commonly found! The depth from the waterline to the lowest appendage below the yacht – often the propellers. 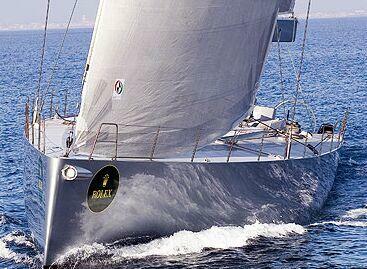 Some displacement yachts have a deeper keel, or propeller guards. These are not practical on yachts which move faster than displacement speeds, due to tracking issues and cavitation. In the Eastern US, most smaller yachts (below 100′) try to maintain a draft of less than 6′, as many inlets and areas in the Florida Keys are restricted to depths of 7′ or less. Enclosure – areas on yachts which are often affected by weather and spray have an enclosure which is often designed to be opened or closed as needed and made from clear vinyl or harder polycarbonate materials. ERIRB – Emergency satellite beacon to be used for search and rescue. Euro Transom – A style of stern which features molded stairways down to an over sized swim platform. Often an engine, or crew access is offered here – however it is not safe to access while underway, thus a secondary access via a hatch with a ladder or a separate stairway is offered through the main aft deck. Flush deck – Refers to the main deck level being on one level. So the helm area can look straight back to the aft deck area (through the salon and galley). Fly Bridge – the open deck area at the top of a yacht, often with a steering station and some protection from the sun. FRP – An acronym for fiberglass reinforced plastic. Many modern yachts are built using fiberglass (plastic stands woven together to form mats of different weights and thickness, depending on the application and when impregnated with catalyzed resin, forms a very strong and durable material). GRP is the yachting term for this used in Europe. Kevlar is a tougher form of the same thing with different applications as well. Full Beam Master Stateroom – refers to the main stateroom for owners where the owner’s cabin goes entirely across the width of the yacht. See on-deck master stateroom. 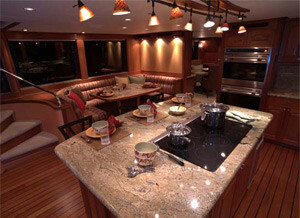 Galley – The kitchen on a yacht. Galley Down – On a catamaran, the galley is located on the lower level alongside the cabins. Galley down is the preferred option for cruising yachts, as there is less motion, greater storage space, and better socialization for the cook. Gel coat – When a fiberglass boat is made, it starts in a mold. The first step is to apply mold-release wax (so that the part can be pulled when done) and a layer of colored gel coat (specially prepared catalyzed resin) is sprayed into the mold, after which the build-up process begins with the fiberglass layers. Gel coat is very porous and is shiny, but also oxidizes or dulls with ultraviolet sunlight. Therefore it is important to keep it clean and waxed regularly, especially in the tropics, or it will appear chalky-looking. Once the gel coat reaches this stage, it can be wet-sanded, compounded and waxed again. Most yachts over 100′ use paint over the gelcoat as it is easier to maintain. Glass Bridge – Refers to the use of multiple LCD screens in the main wheelhouse area for electronics display. Data from ‘black-boxes’ (sounders, radar, navigation charting, cameras, shipboard monitors, etc) are input to these screens and can be arranged to suit on the different screens. Hard Top – A fly bridge cover, typically made of lightweight fiberglass sandwich which covers the forward part of the fly bridge seating and helm area. An advantage of this type of top is that it acts as an insulator from heat (important in tropics), a good anchor point for plastic enclosures (to shield from spray and rain) and necessary in the event that air-conditioning is to be offered. Head – refers to the toilet areas on a yacht. See day head. LOA (Length Overall) – Includes the swim platform and anchor pulpit. This is the number that marinas charge for. LOD (Length on Deck) – The main deck length minus the swim platform and anchor pulpit. LWL (Length at Waterline) – This one is a given. On-Deck Master – Refers to a master stateroom usually found on the forward main deck. One-Off – A term used to describe a custom vessel which is one of a kind and not duplicated. Planing Hull – When a planing hull is either not moving or going very slowly it works like a displacement hull. However, by adding lots of horsepower, a planing hull will rise up over its bow-wave, causing the boat to displace much less water. As a result, there is much less wetted surface on the hull bottom, meaning less friction as well. The speed of the boat will now increase at a great rate. With this hull, the more horsepower you add, the faster the boat will go. Planing hulls are quite stable at higher speeds; however as one would expect, the boats need to be designed well, a light as possible and very strong – as moving around in higher waves will extract a demand on the yacht (and passengers). Pilothouse – Refers to yachts with a lower helm (operating) station, often with a fly bridge station as well. This is particularly nice when out at sea, so that the operator can stay indoors in comfort. Also a synonym for ‘wheelhouse’. Pitch – The movement found on yachts when a wave lifters her bow and then, after passing down her length, lifts her stern – giving her a fore-and-aft up and down motion. Portuguese Bridge – A design feature found on pilothouse yachts whereby one has a walk around deck to the side and forward of the pilothouse protected by bulwarks (high sides) and with a gate going to the foredeck. Propeller – Also called a “prop”, “wheel” or “screw”, propellers are designed to translate engine thrust into forward motion. Modern props on inboard boats and yachts are typically made of nickel bronze (nibral), which is known for its durability, strength and repair-ability. There are good props and mediocre props. Often performance can be significantly impacted with superior propeller design. It is critical that the props be kept clean and matched to obtain rated engine rpm’s (or the engines can suffer). Propeller Pockets – These are inwardly curved areas in the hull directly above the propellers in some boats to allow for less draft and sometimes better performance. Raised Pilothouse – Refers to a design layout common to motor yachts in the 90 – 120 foot range where the helm and wheelhouse sit above an area forward of the salon and aft of the galley (storage and machinery space typically found below) with access to the fly bridge aft and to the main deck on one or both sides. Roll – this is the side to side movement of a yacht while underway. Stabilizers control this unpleasant motion which often is the cause for seasickness. Salon – the main area for gathering and relaxing most commonly found on the main deck. A sky lounge can also act as a second salon. Sky lounge – this is an enclosed area commonly found on ‘tri deck’ yachts which offers a casual lounging area. Semi-Displacement – The semi-displacement hull is a design that attempts to combine some attributes of displacement hulls with some features of planing hulls. It is generally used in mid-range fly bridge cruisers of 50-130 ft in length. The semi-displacement hull never completely planes, but relies on a flat forefoot and lots of horsepower to drive the yacht slightly over the bow wave thus generating some lift. 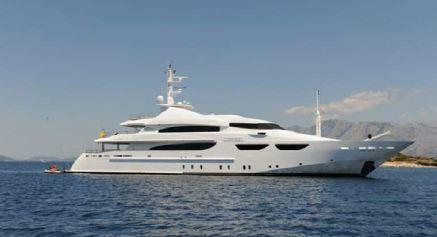 Effectively, the yacht is always driving uphill on its own bow-wave – so fuel consumption is very high. The yacht can be heavier (and offer more living volume) than a planing hull, plus offer a good compromise to operate at displacement speeds. Settee – a couch area which sometimes features a fixed table for casual lounging. Stabilizers (stabilization) – Many yachts employ stabilizers to assist with roll. The most common type is hydraulically powered off the generator or main engines and use digital gyroscopes to control “fins” that protrude from the hull bottom. Some notable innovations have become desirable with the advent of “zero stabilization (that is, stabilizing while at anchor) and gyro stabilization (using high speed gyro’s fastened internally to control roll and pitch). Old style, but effective stabilizers use para-vanes (or flopper-stoppers) which are underwater ‘fins’ which ride underwater on either side of the hull and attached to cables from booms. Another stabilization option for high-speed yachts are trim tab style stabilizers and rotary –roll stabilizers (both offer low -drag options for planning hulls). 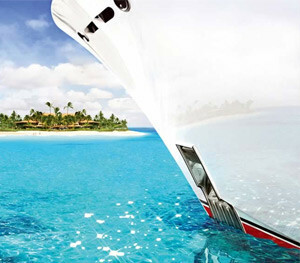 Starboard – looking forward, this is the right-hand side of the yacht. Stateroom – a sleeping cabin on a yacht. Tri deck – A design typical of yachts in the 110′ plus range. Just as the term suggests, the layout is comprised of three decks:a lower deck (typically owner and guest staterooms, with crew separated either all the way forward or all the way aft); a main deck with an aft deck, salon, galley and sometimes a master stateroom forward (on-deck master); and an upper deck with a helm area forward of a sky lounge (small salon) and another aft deck where tenders are typically stored. Often another level above this upper deck features sunning and amenities such as a Jacuzzi, bar, etc. Walk around – Refers to side decks allowing access to the foredeck and aft decks. Most walk around decks have high sides (bulwarks) to prevent seas from washing the side decks and to allow for more safety. Other advantages of walk around decks include being able to traverse the side decks while tying up and untying from a dock, hanging fenders (locks and docks), performing maintenance (cleaning), outdoor socializing, etc. Many yachts folk insist on yachts with walk around decks. Note that having this feature takes away from the interior salon space, which is not as noticeable on wide-beam yachts, but very noticeable on narrow beam yachts. 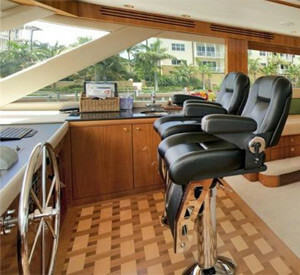 Wide-Body – A feature found on many yachts where the side-decks are eliminated thus allowing for a larger salon area. Almost all wide-body yachts have side-doors which access a side-deck just forward of the salon area. A short “shelf” outside of the salon, typically equipped with handholds, afford maintenance, tying up and fender hanging. Wheelhouse – the enclosed steering station, also known as a pilothouse.